Hitting the shelves of your favorite game retailer just in time for the holidays, Atari is set to release I Heart Geeks on the Nintendo DS platform December 14th, 2011. A refreshing alternative to the standard platform scrolling games, this puzzle-solving adventure will test your mettle as you blast through over 100 levels of brain teasers which will push your creativity and physics skills! You’ll play the part of the socially backward but endearing geek, who is being bullied by the good-looking and powerful jocks at your school. In order to defeat the jocks and become the king of the school social scene (and hopefully win the heart of the girl of your dreams! ), you’ll need to put on your thinking cap as you attempt to solve puzzles with nothing but the law of physics, and a little brainpower, on your side. Each puzzle makes use of physical simulations in order to solve different problems; you might find yourself using devices like motors, gears, ramps, pulleys, electricity, magnets, balloons, steam engines, scissors, or even lasers in order to accomplish various goals. Once you’re done all of the puzzles in a stage of I Heart Geeks, you’ll be greeted with a “boss” level in which you’ll need to make use of all of the concepts you’ve learned in the previous stages in order to beat the bully and make your way on to the next stage. 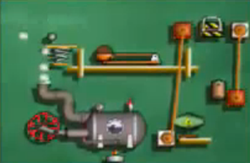 None of the individual stages are timed, so you can take your time as you experiment with the various contraptions and discover the unique solution to each puzzle. However, the boss stage is timed, but failing to beat the boss level simply means that you need to restart the level. This will appeal to younger players for sure, since they’ll need the extra time to practice each level. Some levels require very precise placement of the objects on-screen, which can be maddening at times, but the fact that you aren’t working under the pressure of a clock means that you can take the time to experiment and think outside of the box as you approach the problem from multiple angles. As an added bonus, I Heart Geeks provides a head-to-head mode where two Nintendo DS units can connect wirelessly and battle each other in timed competitions, where the player who solves the puzzle in the shortest amount of time can call themselves the “King of Contraptions”. You can even help each other solve problems that you're having trouble with.There are many hours of puzzle-solving entertainment to be had here which will prove irresistible to family members of all ages.